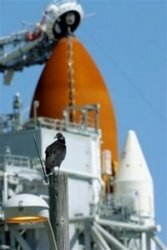 Interesting picture, considering the circumstances of the July 4th shuttle launch. Sure, the photographer probably worked long and hard to contrive this shot, but what if it does have some significance? This entry was posted on at 10:26 am, filed under Tech/Science, U.S.. Bookmark the permalink. Follow any comments here with the RSS feed for this post. Both comments and trackbacks are currently closed.